For more information about NASA spinoffs, please visit spinoff.nasa.gov. As NASA continues its mission to carry human presence deeper into space and expand our knowledge of the universe, the Agency’s efforts also reach into another territory—the inner space of the human body. 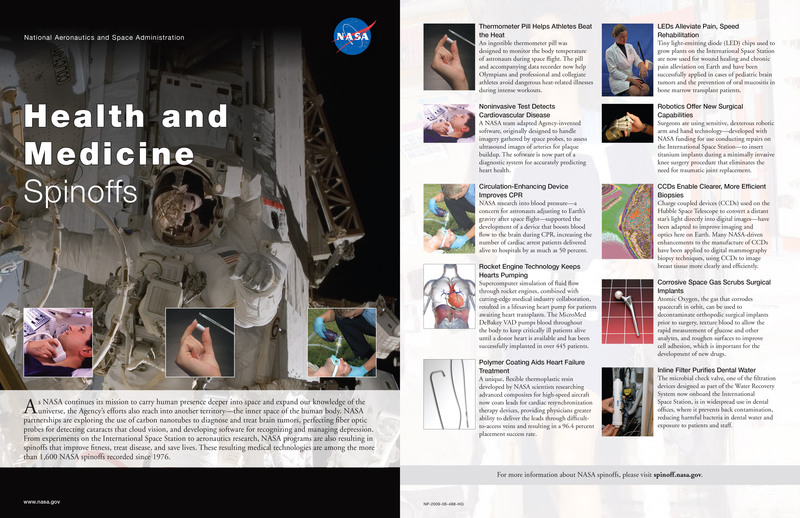 NASA partnerships are exploring the use of carbon nanotubes to diagnose and treat brain tumors, perfecting fiber optic probes for detecting cataracts that cloud visions, and developing software for recognizing and managing depression. From experiments on the International Space Station to aeronautics research, NASA programs are also resulting in spinoffs that improve fitness, treat disease, and save lives. These resulting medical technologies are among the more than 1,600 NASA spinoffs recorded since 1976.